The perennial lament of the freelance travel writer is how hard it is to earn a decent living. Rates haven’t gone up in decades, budgets have shrunk and editors have so much content from so many writers to choose from, just bagging a sale can be problematic. But there’s another problem at play here – that once you have a story that interests editors, you’re only allowed to sell it once. And because you’re so happy to secure a job, you’ll agree to anything they demand. Contracts and work agreements between writers and publishers nearly always mean the rights to the written work are handed to the publisher. Once you’ve signed that paperwork and submitted the piece, they own it, and you can therefore no longer sell it (or earn money from it). But what if it wasn’t like that? What if one article could earn multiple incomes? For me, that target is US$1. I think that’s reasonable and realistic. But because bagging a US$1 per word gig is so rare that when I do there’s a chance I’ll blow half my paycheck on the celebration, I want to see a return to the good ol’ days of selling a single piece of work to multiple clients. If I sell an 800-word piece to Outside Magazine (see my list of 85 paying travel titles here) for US$800, great. I’ll file the copy, cash the check and start working on the next idea. But if I sell that 800-word piece to CNN for US$250, I should be entitled to keep selling the exact same piece elsewhere until it’s earned me US$800. The freelance world used to be like this. And, actually, identical stories being sold to multiple buyers still does happen – as long as you’re a wealthy corporate content provider, such as a newswire service, whose business model is subscription-based. If successful businesses such as AP, AFP and Reuters can sell exactly the same piece of content to multiple platforms, which they do every day, every hour, why does my hard work – that may have taken weeks to create – only get to pay me once? I’ll answer my own question: because freelance work is one of the few ways publishers these days get to own “exclusive” content. You only need to do a Google news search to see how a story proliferates across publishers once it’s out. If the Internet has proven anything, it’s that publishers copy each other (or inspire each other, depending on your angle) not just out of laziness or opportunism, but out of strategic habit. But that’s not the freelancer’s problem, and it’s time to say it, and change it. Let those staff reporters with comfortable wage slips magically appearing on their desks every month earn their keep by digging out the exclusive stories. And let the freelancers earn theirs by hitting revenue goals. There are limiting factors here of course, in the form of legal contracts, and I’m not suggesting anyone burn a relationship to the ground, or get sued, for the sake of a couple hundred bucks. And you have to convince your next buyer that a “second-hand” article is still worthwhile. But this only seems difficult now because the climate we’re operating in is one of exclusivity or nothing. This is the start of a conversation, which may turn into a campaign, that’s trying to turn that around. Photographers have been far better at protecting their rights, and their income, than writers. And it could work, you know. We just need to look to the photography world to see how. When I was at CNN, photographers were given better rights, because – here’s a little editor’s insight I’ll let you in on – they fussed and screamed and stamped their feet until we did so. Contributors were urged to sign an agreement that saw all rights handed to CNN once a project was accepted. But when it came to photographers we had a second, more generous contract waiting in the wings just in case they voiced concerns with the first. This alternative contract wasn’t entirely guilt-free – rights remained with CNN until six months after publication, when the rights were then shared between CNN and the photographer. But it did at least mean the photographer could re-sell those photos and make more money from them. 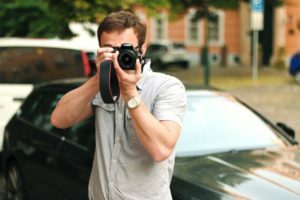 Photographers are far more possessive over their creations and the rights to those creations than writers, and it means, at CNN, they’ve won this mini battle. As long as they ask (sometimes they have to ask twice, but still), they’ll be handed a superior contract. It’s time writers took a leaf from the photography school of content ownership, and started demanding superior rights. So, next time you sign up a client, ask for an agreement that allows you to sell the exact same piece of copy elsewhere. When they laugh in your face, ask again. And again. I’ve started. My newest client gave me an agreement similar to the six-month agreement above between CNN and fussy photographers. He didn’t even need too much convincing. In the Internet age six months may still seem like a losing deal, when anything older than a week is ancient news. But it’s a step in the right direction and right now that’s a win.